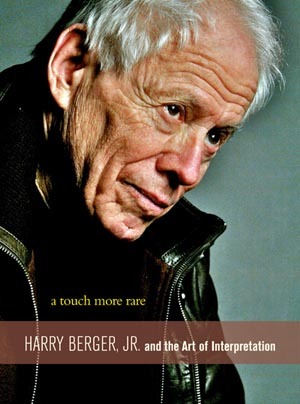 A Touch More Rare: Harry Berger, Jr. and the Art of Interpretation (Fordham University Press, 2009) celebrates more than four decades of groundbreaking work by UC Santa Cruz emeritus professor of literature and art history Harry Berger, Jr. The book's 19 essays serve as a tribute to a revered and respected literary and cultural critic, whose vast body of work led to his election to the American Academy of Arts and Sciences in 2006. An internationally recognized scholar and founding faculty member of UC Santa Cruz, Berger is known for a wide-ranging and interdisciplinary approach that goes far beyond traditional academic boundaries. Berger studied literature and art history at Yale University, where he earned his B.A. and Ph.D. in English and taught for 12 years. He came to UC Santa Cruz in 1965 where he taught a variety of subjects under the general category of culture theory and Renaissance culture, including Renaissance drama and Shakespeare. In art history, he specialized in Italian and Dutch painting and the theory and practice of portraiture. Berger has published extensively over the years, with numerous books and more than 100 articles to his credit. As he noted in a 2002 interview: "Sometimes I have a sense of myself as sitting at a typing table and floating on a cloud for 50 years." Although he retired in the 1990s, Berger continues to teach classes as an emeritus professor at UCSC, as well as lead seminars for faculty and students at such venues as the Newberry Library and the Shakespeare Society of America. Berger's most recent books include Manhood, Marriage, and Mischief: Rembrandt's 'Night Watch' and Other Dutch Group Portraits (2006) and Situated Utterances: Texts, Bodies and Cultural Representations (2005). Still a prolific author, Berger noted that he is currently preparing three separate books that have been accepted for publication by Fordham Press on Shakespeare, Plato, and Edmund Spenser, and has several more in the works. A Touch More Rare: Harry Berger, Jr. and the Art of Interpretation, edited by Nina Levine and David Lee Miller, will be published this spring by Fordham University Press (800-996-6987, www.fordhampress.com).